I am reading a most amazing book by a husband and wife team who began a small farm, La Ferme du Bec Hellouin, in 2004 in Normandy. This small farm was deliberately and mindfully built as an alternative to the big industrialized agricultural farming complexes that take lots of expensive equipment and chemical compounds to produce food for the masses. The farmers, Perrine and Charles Hervé-Gruyers, wanted to make a real family farm, one that produced good food and nourished their family and their neighbors. They wanted the farm to be the work of their own hands and they wanted it to be a viable business model that would be self-sustaining. Over the years they brought together in one comparatively small place a collection of sustainable, bio-intensive small-farming methods and techniques which produces a mountain of food in a small place over and over again. They’re still working on their last objective, turning the farm into a sustainable business, but it is starting to come together very well indeed. In the process they created a beautiful poem of a garden that supplies food for a number of local restaurants and is also an incubator of ideas and a resource and school that attracts students from around the world. 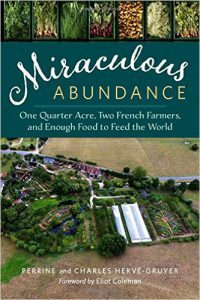 You can read about their work, their mistakes, and their triumphs in their book, MIRACULOUS ABUNDANCE: One Quarter Acre, Two French Farmers and Enough Food to Feed the World. The first, foundational bio-intensive gardening idea the Hervé-Gruyers incorporated into their own gardens was la culture maraîchère, market gardening. This form of gardening developed in the heart of Paris during the second half of the 19th century and was pretty much the direct descendant of the gardeners who provided the raw materials to the chefs and cooks who fed the kings and nobility of France. 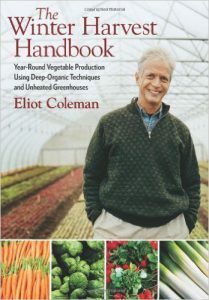 The success of the market gardeners of France from the late 1600’s though the early 1900’s established urban gardening practices that have lasted well into the 21st century and have spawned other methods of growing that are also remarkable ways to produce a lot of good-quality food. The French urban gardeners evolved intensive soil-building techniques and developed extraordinary methods for extending the growing season. Prince Peter Kropotkin, a Russian anarchist writer of the late 19th century, was very impressed by the Parisian market gardeners. He pointed to them as an example of how local communities could become thriving, self-sufficient communities and used them as working models that showed how his ideas of strong local economies and self-determination could work. The market gardeners were the early forerunners of the post-modern idea of “eating as local as you can.” They made it real more than 150 years ago. “French intensive gardening,” as it was called in English, was designed to grow the maximum amount of vegetables on the minimum area possible. Urban plots used for this way of gardening were invariably small and noncontinuous, after all. The average Parisian market garden was between one and two acres in size. The plants were grown on eighteen-inch beds of combined straw and horse manure from the stables. Crops were planted so close together that when the plants were mature, their leaves would barely touch. This close spacing provided a mini-climate and a living mulch that reduced weed growth and helped hold moisture in the soil. Companion planting — growing certain plants together that enhance each other – was used. For example, strawberries and green beans produce better when grown together; whereas onions stunt the growth of green beans. 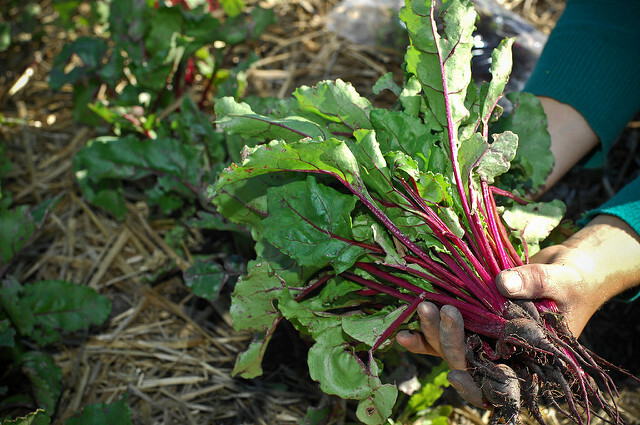 In addition to companion planting, gardeners developed an elaborate schedule of succession planting to get the most from the land throughout the growing season. Timing was key. An early spring hotbed would be sown with radish and carrot seed broadcast and then transplanted with lettuces at the same time. First, the radishes would be harvested, making more room for the carrots growing between the lettuces. The carrot tops would stick out from around the lettuces until the lettuces were harvested, which gave the carrots enough light and space to complete their growth. But, as soon as the lettuces were harvested, young cauliflower transplants would be set out among the carrots. Once the carrots were pulled the cauliflowers had the frame to themselves until they were harvested and the ground was prepared for the next crops. Gardeners grew up to nine crops each year and could even grow melon plants during the winter. The goal of the market gardener was always to “tend the smallest amount of land possible, but tend it exceptionally well.” The work was non-stop. The care given to each individual plant was highly detailed-oriented and labor-intensive. Soil-building became almost a cult. Among the garden marketers who rented land to make their gardens, it was a condition of the standard renting contract that the gardener could carry his soil away down to a certain depth when his tenancy ends. The reasoning went that because he made soil himself, it belonged to him and when he moved to another plot he could carry his soil away, together with his frames, water pipes and other belongings. Pesticides and chemicals were avoided. (Kropotkin called them “pompously labelled and unworthy drugs.”) Large amounts of compost, crop rotation, diversity, companion planting and plant protection were enough to prevent most diseases and pest outbreaks. It was felt that pests attacked only sick and weak plants; healthy plants in healthy soil would not need extraordinary measures. Also, small plots with diverse plantings have a tendency to keep pests from multiplying as they do in monoculture plantings where one pest infestation can wipe out entire fields. 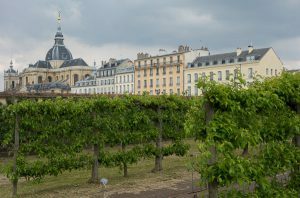 The techniques of season-extension for which the gardeners were especially celebrated began at the royal potager gardens at Versailles under the celebrated head gardener La Quintiie in the 1670s and 80s. These practices were extended and enhanced so much that the established urban gardens of the late 19th century could provide fresh vegetables for much of the year in Paris. Market gardening was introduced to England by C. M. McKay, a Fellow of the Royal Horticultural Society, who led an expedition to Paris to see the techniques in 1905. A number of how-to books were published for English audiences, including a popular one by McKay himself. The techniques became quite popular, although they never quite achieved the level of sophistication seen in Paris. In the 1920s and 1930s, English gardener and dramatist Alan Chadwick experimented extensively with the French intensive techniques, combining them with techniques from Austrian Rudolf Steiner’s biodynamic method to form the “French Intensive-Biodynamic” method of gardening. After the First World War, la culture maraîchère began to wane in France and England. Land values soared, and empty lots were developed or became too valuable for gardens. More importantly, cars replaced horses on city streets, and the straw and manure that had been so important disappeared. 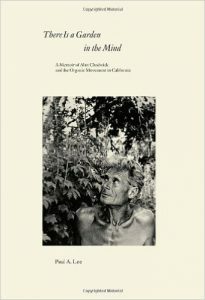 In the 1960s, Alan Chadwick brought his techniques to America on a 4-acre organic student garden at the University of California’s Santa Cruz campus. Starting with a hilly area of poor, clayey soil, Chadwick was able to eventually produce healthy topsoil and yields four times that of conventional agricultural methods. Chadwick grew his crops on rounded raised mounds and used the “double dig” method – removing the top soil layer, exposing the subsoil or hardpan beneath, breaking it up, adding organic matter, and replacing the topsoil that was initially removed. This provided greater drainage and aeration. The techniques were studied by John Jeavons of Ecology Action, who wrote a popular book promoting these methods under the name GROW-BIOINTENSIVE. 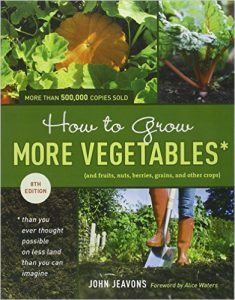 Jeavons’ book, HOW TO GROW MORE VEGETABLES THAN YOU EVER THOUGHT POSSIBLE ON LESS LAND THAN YOU CAN IMAGINE (usually abbreviated to just the first five words), was first published in 1974. It helped to revive and extend the French Intensive Methods for a new generation in a new country. On the other hand, there is all that beautiful, beautiful food…..
Ron Finley, in this TED talk, tells about his efforts to grow food for himself and his neighbors in his community in South Central Los Angeles. The poem continues…. The way your heart says you must. Your comfort and your strength. It is waiting to embrace you.